Driving the streets of Siem Reap is experience in itself. For the most part driving occurs on the right-hand side, but people also tend to drive where ever there is room. 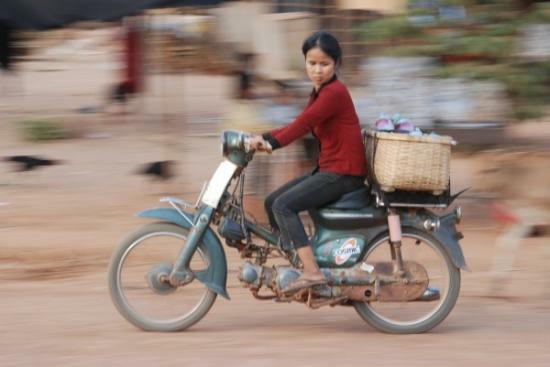 Motor bikes, tuk-tuks, and bicycles are the norm. The motor bikes haul huge loads. We saw a man carry two large pigs on his bike. Another bike loaded with fuel had wiped out and our guide got out to help. Larger vehicles like our bus constantly honk their horns to warn the smaller vehicles to look out. Small ‘gasoline stands’ line the streets. These are basically shelves lined with reused glass soda bottles filled with gasoline. We were told, although illegal, the gasoline was most likely watered down. So far I have seen green, pink, and yellow gasoline.